The strategy included engaging stakeholders, especially naysayers - NGOs and consumer advocacy groups - to earn an opportunity to be part of the solution. BPA has long been an ingredient in the epoxy resins used for the coatings inside metal cans. For decades, it’s what kept food fresh and consumers confident that products were safe. But as scrutiny of BPA increased, raising the specter of contamination, Valspar Packaging knew that business as usual wouldn’t work. 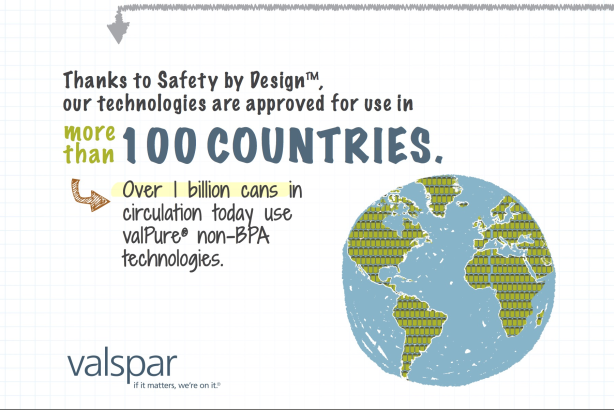 In the period leading up to its launch of valPure V70, a substitute for BPA-based solutions, Valspar and its PR partner, Burson-Marsteller, decided to break the mold. Their strategy included engaging stakeholders, especially naysayers — NGOs and consumer advocacy groups — to earn an opportunity to be part of the solution. Confident in their research and the soundness of the product, the team aimed to minimize criticism and turn Valspar Packaging into the leader of non-BPA solutions. The process included can makers, as well as such food and beverage brands as Red Bull and Coca-Cola, involving them in the safety by design product-development phase and how they would respond to critics. Valspar also engaged experts including toxicologists to evaluate V70 during product development. Valspar followed up with a trade campaign. Ads highlighted the company’s efforts to listen to stakeholders and critics and build confidence in V70. Editorial placements were made in trade publications, and a website dedicated to valPure was developed. Called "risky and bold" by judges, this "innovative strategy assuaged critics" while finding a way to "showcase the technology benefits," another judge added. V70 has either been approved for trials by six of the top 10 global food and beverage brands or is in the final stages of approval, one of which will feature the following tagline on cans: "valPure non-BPA lining." As a bonus, several key consumer groups applauded the way Valspar engaged them. Businessolver wanted to be the primary HR solutions provid­er, so it hired Edelman to undertake a campaign to position the company as the brand that empowers HR pros to "be the solution." The campaign focused on thought leadership through a "workplace empathy monitor;" content creation that addressed buyer pain points; and the strategic targeting of prospects. In addition to driving a 100% increase in web traffic, more than 40% of Businessolver’s targeted list engaged with content. RFPs jumped 40% and sales were projected to increase by 8% for the year.